I know, I know it is the publishing release of the year, and it is here! The NativeAdBuzz Native Advertising Mastermind Forum For Native Advertisers Who Want To Do Native Advertising Really Good And Stuff And Other Things Tooo! And instead of charging $97/month for it like every other premium forum in the industry, we have decided to bundle it in with your Native Ad Buzz subscription! We have cultivated the forum so far with no promotion, and already it has picked up plenty of Native Buzz and now we are releasing it into the wild formally. Why did we release a native advertising mastermind Forum? So whats this internet marketing mastermind forum all about, what’s it for? Sneak peak at some of the forum contents. This is an easy one. Forums are awesome. All our learning years ago happened on Forums. At first we were lurkers, too shy to post just there to read and learn, then as our understanding grew we began to ask questions and as our confidence expanded we moved to even answering them. Before we knew it we were the expert Affiliate internet marketers on the forum, but it was the forum that had made us. And so when we realised that people found NativeAdBuzz super useful, but many lacked the experience or understanding to take action, we knew we had to help somehow. We tried a Facebook group to test it out But Native Advertising Affiliates and Arbitrage people don’t like talking stats on an open platform like Facebook, they wanted a private forum where they could discuss chat and share value a platform where the latest native Affiliate and Arbitrage techniques could be documented and all threads easily searched. Another simple one. It’s for you, to help you become more successful. In this forum we discuss all things Internet marketing related and even those topics that might not be but that affect all of us internet marketers. We all know what they are! Our goal is a lofty one, but an important one. We aim to support everyone to reach their business and life goals through successful native affiliate, arbitrage and other internet marketing models. It is a safe place to share and discuss that only members of NativeAdBuzz can access. Ok sounds good I know, but what’s actually on the inside? Good questions here are a few of the current trending topics in the NativeAdBuzz mastermind forum. The Importance of Visitor Quality: Something that is overlooked by….er well pretty much everyone! 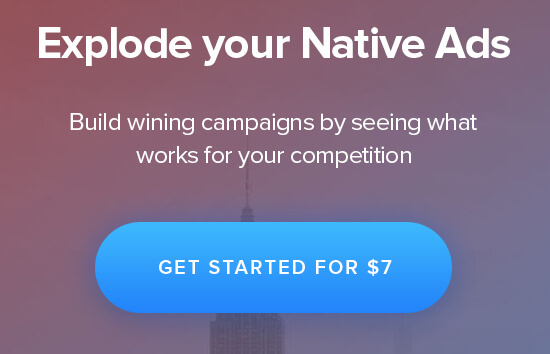 You get a 7 day trial for $7 which includes 7 days access to NativeAdBuzz spy tool, 7 days access to the NativeAdBuzz mastermind forum.